The Norton Anthology of Western Philosophy: After Kant provides a comprehensive introduction to the predominantly European (“Continental”) interpretive tradition of philosophy after Kant in one volume, and to the now predominantly Anglo-American analytic tradition in the other. It features the extensive editorial apparatus for which Norton Anthologies have been known and trusted by professors and students alike for more than 50 years. Ideal for courses at all levels in the history of philosophy after Kant, these volumes belong on every philosopher’s (and philosophy student’s) bookshelf. The Norton Anthology of Western Philosophy: After Kant offers a rich collection of primary texts and a wide array of leading figures. In selecting both complete essays and sets of carefully chosen excerpts from longer works, the editors have designed these two volumes to be the most revealing, engaging, teachable, and flexible collections of nineteenth- and twentieth-century philosophical texts available. Taken together, the general and figure-specific introductions in both volumes provide an exceptionally accessible and helpful guide to many of the most important figures and developments in philosophy after Kant. 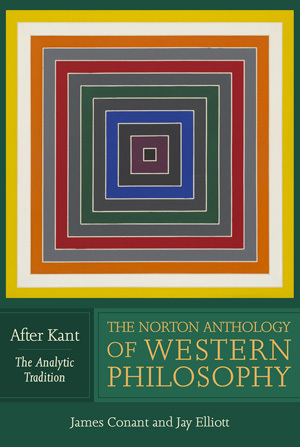 The Norton Anthology of Western Philosophy: After Kant provides an unequaled synthesis of superb collections of primary texts, presentations of their authors, and treatments of the philosophical traditions they created. The Norton Anthology of Western Philosophy: After Kant offers an abundance of carefully selected readings making its two volumes--available individually or as a discounted package --the most teachable and versatile texts available for courses in the history of recent modern philosophy, at an unbeatable price.